54 | TH E M R EP O RT O R I G I NAT I O N S E R V I C I N G A NA LY T I C S S E C O N DA R Y M A R K E T ANALYTICS THE LATEST Hot Housing Up-and-coming markets poised to top the heap in 2016, as some long-time locales drop off the map completely. O ne can only wonder what the next year will bring in terms of housing. One thing is for sure though: The picture will look completely different as fiery markets begin to cool down. Realtor.com's 2016 Housing Forecast showed that new markets where buyers and sellers are more motivated and active will emerge in 2016. The days of San Francisco, Denver, and Dallas dominating the housing market are soon to end. 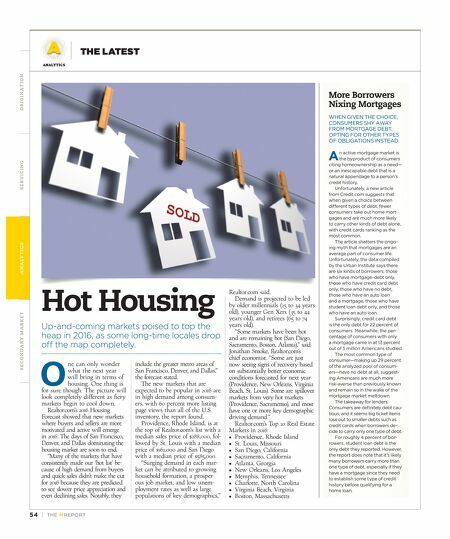 "Many of the markets that have consistently made our 'hot list' be - cause of high demand from buyers and quick sales didn't make the cut for 2016 because they are predicted to see slower price appreciation and even declining sales. Notably, they include the greater metro areas of San Francisco, Denver, and Dallas," the forecast stated. The new markets that are expected to be popular in 2016 are in high demand among consum - ers, with 60 percent more listing page views than all of the U.S. inventory, the report found. Providence, Rhode Island, is at the top of Realtor.com's list with a median sales price of $288,000, fol - lowed by St. Louis with a median price of $162,000 and San Diego with a median price of $585,000. 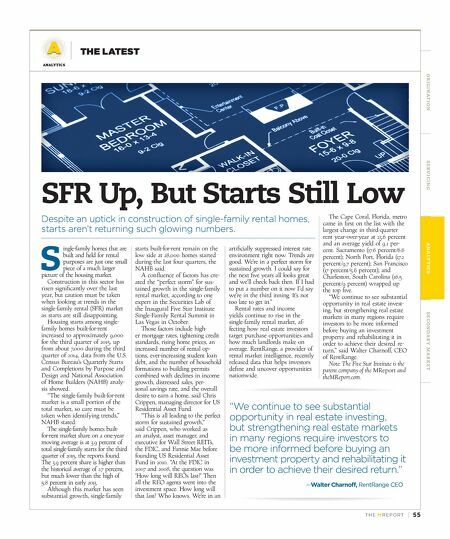 "Surging demand in each mar - ket can be attributed to growing household formation, a prosper- ous job market, and low unem- ployment rates as well as large populations of key demographics," Realtor.com said. Demand is projected to be led by older millennials (25 to 34 years old), younger Gen Xers (35 to 44 years old), and retirees (65 to 74 years old). "Some markets have been hot and are remaining hot (San Diego, Sacramento, Boston, Atlanta)," said Jonathan Smoke, Realtor.com's chief economist. "Some are just now seeing signs of recovery based on substantially better economic conditions forecasted for next year (Providence, New Orleans, Virginia Beach, St. Louis). Some are spillover markets from very hot markets (Providence, Sacramento), and most have one or more key demographic driving demand." Realtor.com's Top 10 Real Estate Markets in 2016: • Providence, Rhode Island • St. Louis, Missouri • San Diego, California • Sacramento, California • Atlanta, Georgia • New Orleans, Los Angeles • Memphis, Tennessee • Charlotte, North Carolina • Virginia Beach, Virginia • Boston, Massachusetts More Borrowers Nixing Mortgages WHEN GIVEN THE CHOICE, CONSUMERS SHY AWAY FROM MORTGAGE DEBT, OPTING FOR OTHER TYPES OF OBLIGATIONS INSTEAD. A n active mortgage market is the byproduct of consumers citing homeownership as a need— or an inescapable debt that is a natural appendage to a person's credit history. Unfortunately, a new article from Credit.com suggests that when given a choice between different types of debt, fewer consumers take out home mort- gages and are much more likely to carry other kinds of debt alone, with credit cards ranking as the most common. The article shatters the ongo- ing myth that mortgages are an average part of consumer life. Unfortunately, the data compiled by the Urban Institute says there are six kinds of borrowers: those who have mortgage-debt only, those who have credit card debt only, those who have no debt, those who have an auto loan and a mortgage, those who have student loan debt only, and those who have an auto loan. Surprisingly, credit card debt is the only debt for 22 percent of consumers. Meanwhile, the per- centage of consumers with only a mortgage came in at 13 percent out of 5 million Americans studied. The most common type of consumer—making up 29 percent of the analyzed pool of consum- ers—have no debt at all, suggest- ing Americans are much more risk-averse than previously known and remain so in the wake of the mortgage market meltdown. The takeaway for lenders: Consumers are definitely debt cau- tious, and it seems big ticket items lose out to smaller debts such as credit cards when borrowers de- cide to carry only one type of debt. For roughly 4 percent of bor- rowers, student loan debt is the only debt they reported. However, the report does note that it's likely many borrowers carry more than one type of debt, especially if they have a mortgage since they need to establish some type of credit history before qualifying for a home loan.